Russian mathematician George Gamow, who counter-intuitively defined different sizes of infinity, might have considered an additional definition that could take into consideration the fact that, as a purely practical matter of our mortality, the world’s writers offer an inexhaustible abundance of riches. Still, on occasion I read a work that abruptly creates an event horizon in this infinitude, proves capable of bending the light that literature gives off to such an extent that most other novels suddenly seem - relatively speaking – dim and diminished. I’ll risk this: Norwegian author Karl O. Knausgaard’s novel A Time for Everything (translated by James Anderson, Archipelago Books, 2008, initially published in hardcover under the title A Time to Every Purpose Under Heaven) is the most breathtakingly original and subversive contemporary novel I’ve read in years. It’s also the most unusual, with a conceit I normally would have found utterly off-putting were it not for the inextricable pull of the first page. I fear betraying the novel by being in any way reductionist, as A Time for Everything, like most great literature, defies encapsulation. It commands both the reader’s attention and pace, offering profound pleasures and challenges that crackle along the edges of consciousness and occasionally explode into it. There is nothing cheap in Knausgaard’s novel. The skeletal outline of A Time for Everything appears anything but promising, and in fact sounds like the melodramatic quasi-religious mystical muddle one might find in a Dan Brown book: a treatise on - of all things – angels, incorporating retellings of biblical stories interspersed with the metaphysical speculations of a fictional 16th century Italian theologian. 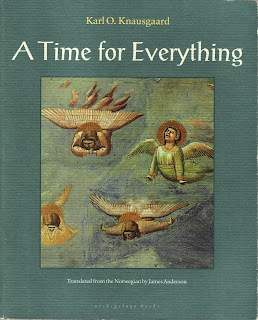 A Time for Everything leads us exactingly through Bellori’s philosophical exploration into the nature of angels and their curious appearances in scripture. Who are they? What are they? Why do they suddenly appear without explanation in the Bible? What relation do they have to God and to humanity? Are they living or dead? Material or other? Are they perhaps a kind of negative of human beings? Direct representations of God or separate celestial colleagues? Emanations of God’s volition or independently-willed creatures? Why do they only reveal themselves when they do, and why only to certain persons? Rather than allowing these questions to come off as ponderous (or for that matter, ridiculous), Knausgaard manages to make Bellori’s line of inquiry engrossing not simply in its application of an empirical approach to biblical accounts (that A Time for Everything occasionally inspires a sense that one might be reading a peer-reviewed study of angels is enough to pull one out of Knausgaard’s seductive prose for a blinking moment of rational re-orientation), but also in its rigorous lesson in critical reading, using that bestselling text in the western world, the Bible – more specifically, its various, curious mentions of angels, seraphim, cherubim, and the like. These Knausgaard plumbs deeply and reconstructs into daringly imagined stories. What at times appears to be a theological inquiry – and it does, on that level, raise broadly stimulating, provocative questions about the relationship between the divine and the human, the immanent and the corporal, God’s omniscience and omnipotence, and the multivariate modes of human inquiry – is also a daring plunge into the glaring lacunae of the biblical accounts. When the narrator abruptly departs from Bellori’s biography to lead us into the first of these retellings – of the story of Cain and Abel - what appears in the Bible as a tale tossed off in a mere two lines is spun out into a hundred pages of narrative, the first page of which finds the brothers inhabiting a wide valley ringed by snowy mountains and boreal forests. Someone is wearing black trousers, a white workshirt, red spats. What’s going on here? We appear to be in Norway, perhaps in the 19th century. We’re most certainly not in ancient Mesopotamia. Why, given such a careful reading and questioning of the inconsistencies, contradictions and narrative holes in the Book of Genesis, are we suddenly thrust into a retelling so manifestly incongruous with anything suggestive of the Old Testament Middle East? He turns and glances over toward the houses lying beneath a hill on the side of the field, and he sees that the figures, at this distance little bigger than beetles, will soon be home…And it’s as if they’ve held him captive, for only now, now that they’re no longer there, does the landscape he’s been in all day long reveal itself to him…The undulating cornfield with its grayish, dusty surface glimmers almost golden in the sunshine. The lush crowns of the trees that grow between the field and the encircling mountains on the opposite side of the valley form one single band of green, on the slope close to him one could pick out individual species: aspen, alder, oak, willow, pine, spruce. The small unique habitats they each support. The jutting ledge beneath the pine covered in places with dry, green moss, in others bare and bluegray, everywhere carpeted in yellow pine needles. The blooming rose-hip thicket that nestles close, the air above it heady with bumble-bees and wasps. Its roots reaching serpentinely across the mountain only to disappear into the earth nearby. The straight pine trunk blushing in the glow of the evening sun, the shadow it throws cross undergrowth and bushes, up across the hillside. The grassy bank below still flecked with wintry yellow, the barely year-old saplings that grow there, delicate and seemingly uncertain, as if they’ve ventured onto an ice that is so thin that they don’t dare to go on, or have the courage to turn and retreat to the safety of the forest, but must simply stand there motionless and wait until someone comes to rescue them. Fiction can obviously do what a religious text like the Bible cannot, and as literature, the passages in the Bible that provide material for A Time for Everything come up embarrassingly short compared to Knausgaard’s luminous, expansive incarnations (A Time for Everything should find a secure place in those standard undergraduate course offerings on “The Bible as Literature”). But to imagine that A Time for Everything is a book specifically about this religion or this holy book would, I think, be to miss its larger scope. It is not simply an attempt to reinvigorate biblical tales, which it nevertheless does astonishingly well while pushing beyond the way that, for example, Roberto Calasso revived Greek and Hindu myths. Neither is this one of those works like East of Eden that employ biblical elements to add depth and mythic resonance to a contemporary tale. Nor does Knausgaard take a mere deconstructionist approach to these stories. If anything, his is what might be called a supraconstructionist approach, taking the grain of these tales and causing them to effloresce, spinning from the thin strands of their DNA a whole living world. Recapitulating biblical myth - by extrapolating, from these familiar tales told in the Bible via a few cursory and authoritarian bare-boned lines, lengthy narratives with flesh - is nothing new (as anyone who’s ever been to a Sunday sermon at an AME church can readily attest), but this is no evangelically-motivated attempt at enrichment. I can recall few novels that offer anything approaching the unexpectedness in Knausgaard’s reinventions. His retelling of the story of Cain and Abel is not simply an imagining of it in a humanly comprehensible setting, but a profound questioning – in completely unexpected directions - of murder and transgression. His retelling of the story of Noah and the ark likewise spares nothing in his insistence that we be charged with envisioning the reality represented by the myth: the crazed eccentricity of Noah’s obsession, the geological and ecological impact of a world covered in billions of tons of water (oh, and about those creatures of the sea? ), and the heartlessness with which Noah had to have abandoned those left to drown, depicted in a scene made powerfully incarnate by the matter-of-factness with which the waters’ rising around a mother and child is recounted. Despite its flirtations with the immanent, A Time for Everything is a strikingly physical, body-centered novel. Knausgaard fleshes out these stories literally; their flesh-and-blood grounding involves occasionally shocking attention to the body. Taking instances of angels’ appearances in the Bible and examining them in the manner that science has treated of physical phenomena, Knausgaard brings rationalism to bear on an ostensibly irrational phenomenon, approaching spiritualism head on with rationalist tools - not to dismantle it, but to establish a line against which it must be argued. A Time for Everything subverts fundamentalism by making a fundamentalist interpretation of the Bible impossible in light of the empirical, in light of the evidence provided by the Bible itself. A question never far away is these tales is: how do we know what we know? When Noah’s sons see their father for the first time following his discourse with God, the narrator asks of one of them, “What was he actually seeing when he looked at his father?” This is a question that runs throughout Knausgaard’s novel: what are we actually seeing when we look at a character? When we read a text? When we accept as sacred a religious book like the Bible? It is almost as though Knausgaard has set out to turn these religious founding documents on their head, and by so doing perform a sort of exorcism of fundamentalism. The radicalism of A Time for Everything lies in its firm insistence on the precariousness of rationalism, that at the dawn of the Enlightenment modes of inquiry into science and into religion (a treatise on angels, for example, in the case in point) were on a more or less equal footing, and that, given different circumstances, the latter might easily have dominated the former, leading to a completely different world. In one particularly engaging scene, the young Noah (envisioned as a precocious albino savant who cannot withstand the sun) tries nightly to work out a system for categorizing the world, a kind of rudimentary scientific method that harkens back to Knausgaard’s observation at the beginning of the novel that the world might easily have chosen to prioritize a religious inquiry such as Bellori’s theories of angels over the scientific method that gave us the Age of Reason. A warning about the fragility of human systems is implied, that the Dark Ages might well have continued and can always return (a not insignificant point in a world where religious fundamentalists and fanatics continue to attack inquiry and openness through denunciations, fatwahs, censorship, general anti-intellectualism, and even violence and terror). The dust swirls about his feet. Even though he holds his robe above his knees with one hand, he’s so eager that he almost trips several times. And when he throws himself on the ground before them, he’s so out of breath that at first they can’t make out what he’s saying. At the same time, one never gets the impression that Knausgaard is baiting his readers; his encyclopedic knowledge of not only the Bible but also a whole range of Judeo-Christian theology makes that nearly impossible. He’s grounded as a good scientist is - in empirical inquiry refined into assertions that set a new bar for being challenged – yet never loses sight of the fact that he is first and foremost engaged in a literary enterprise, and an exceptionally rewarding one both in terms of the breadth and the captivating liveliness of his imagination. The novel ends on a note of deliriously high humor – or almost. Reaching the last line of the novel I wished there had been a blank page inserted between it and the subsequent, deeply confounding “Coda,” which, left unread, would make A Time for Everything a different book than it is. In fact, in choosing to provide a coda to a story that ends as it does, Knausgaard provides us two novels, one for romantics and another for realists. This pointedly troubling section is a radically bracing departure from the rest of the novel (readers may be advised to pause before continuing with it). From one point of view, the coda – in which we encounter the book’s anguished contemporary narrator, a writer seeking solitude on a barren, isolated island off of Norway’s coast - seems entirely superfluous and unnecessarily complicating. In addition, despite the narrator’s vow to eschew self-absorption, the coda has the effect of being full of just that, almost a way of drawing attention to the struggles Knausgaard himself must have gone through in order to produce this rich, meticulous and vastly researched book (and if A Time for Everything offers irrefutable testimony to the novel’s not being dead, it also resurrects the long dormant figure of the tortured artist). But from another point of view the coda provides the novel its most trenchant meaning, identifying at last its narrator and situating him in the contemporary world where angels have devolved from the incandescent entities they once were through various diminishing stages of incarnation into a form that has pretty much nothing to offer to anyone anymore, where the role they played in the stories of the Bible, as powerful intermediaries between God and humankind, no longer has meaning, and where even an attempt at awakening as extreme as the writer’s self-inflicted desecration of his own body (as though he could inscribe directly into the flesh a sense of significance) reveals him in a state of torment, bereft of the richness of meaning and assurance the world of faith and belief once provided, left only with the raw struggle to create. 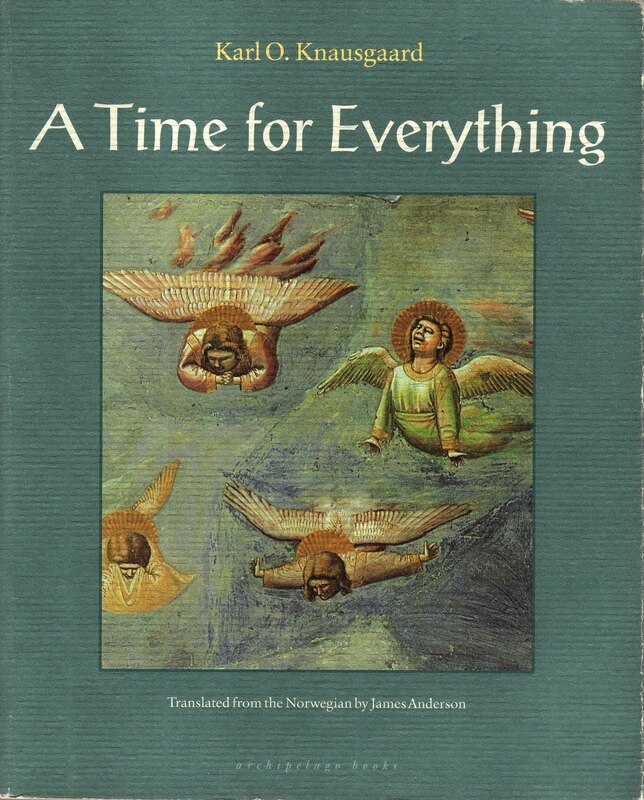 A Time for Everything is not a difficult novel, but it demands patience and careful attention. While the retellings of the biblical stories in which angels appear unwind with the delicate, measured pace and exquisite attention to detail that mark the best kind of storytelling, the interstitial explorations of theological questions require more diligent reading. However, Knausgaard’s forays into philosophy and theology in his ambitious work keep a steady, artist’s eye on the fact of A Time for Everything’s being a work of fiction. And as novels go, it is daring, thrilling, infinitely rewarding fiction of the highest order, playing among the angels where they themselves might fear to tread.